Port Aransas in Nueces County, Texas is a small vacation beach and fishing town with about 3,480 local residents. The town sits on Mustang Island, one of the longest barrier islands along the Texas coast. Corpus Christi Bay and the Gulf of Mexico surround the town. You'll enjoy taking your friends and family fishing in the Gulf Coast for some of the finest fishing in South Texas. Port Aransas is on the northern tip of Mustang Island and about 40 minutes from Corpus Christi. During your vacation stay up-to-date on the latest tides and marine weather. The Fisherman's Warf, Dolphin Express, Woody's Sport Center and Texas Charter Fleet are excellent places to inquire about fishing charters, guides and all the equipment, bait and tackle you'll need to enjoy a fine fishing vacation in Port Aransas. Remember to visit the Island and Surf Rental Shop to rent to a SUP, Golf Cart Buggie, Scooter, Surfboard, Bike or Kayak. Sunglasses and accessories too. 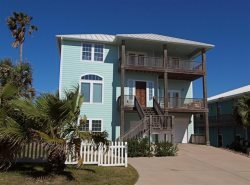 Tradewinds Vacation Rentals offers the perfect vacation homes in the heart of Port Aransas and just a few blocks from the beaches. Our beautiful homes are spacious and clean, and convenient to groceries, Winton's Candy Store, restaurants and the favorite shops of Port Aransas. Each cottage features a patio area and swimming pool area for your family. If you're intent is to fish for the popular Redfish, be sure to shop the local fishing guides and explore the Port Aransas marina.